Twelve South HiRise Duet and Belkin Valet Charge Dock review: Which iPhone and Apple Watch charging dock is better? 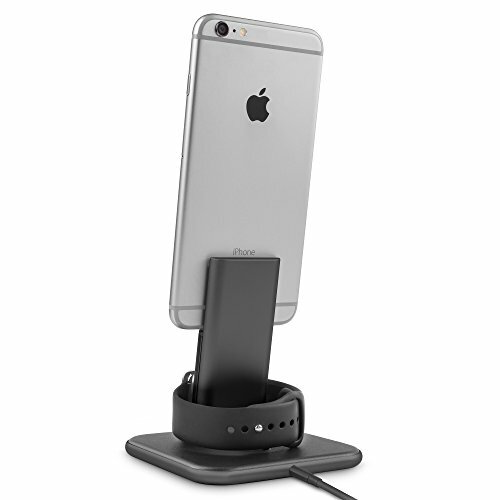 Each weighty stand can charge both devices with ease, but one of them adds extra perks. The more electronic devices you bring into your life, the more things you’ll have to charge to make sure that they’re ready when you need them—and that’s especially true with smartphones and smartwatches. For the average user, both the iPhone and Apple Watch need to be charged daily to ensure that they can last through another frame. Adding an Apple Watch to your daily ensemble means another thing to manage, and another thing to make sure ends up on a charger at night. That was one of the big reasons why I fell out of an everyday routine with the Watch: I’d forget to charge it, find it sapped of battery life the next time I wanted to wear it, and then I’d stop using it for a while. 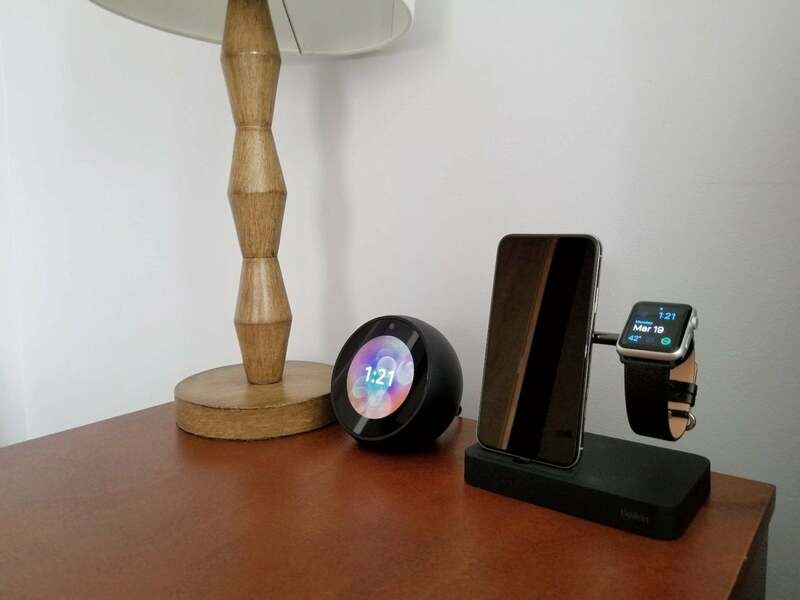 If you have a bad habit of moving around your Apple Watch charger, or just don’t want to have a bunch of cables on your bedside table, there are a couple of docks that can elegantly handle both devices at once. Belkin Valet Charge Dock (left) and Twelve South HiRise. 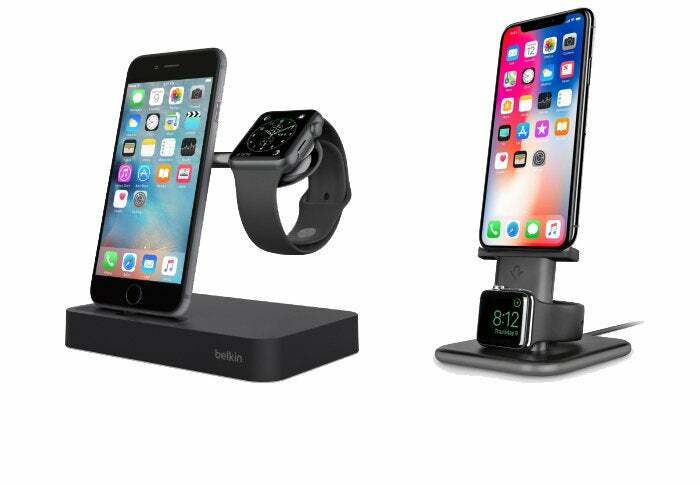 The Belkin Valet Charge Dock and Twelve South HiRise are very similar in approach: both are weighty, pricey bedside docks that can charge both an iPhone and Apple Watch at once. And unlike some cheaper devices, you don’t need to loop your existing Apple Watch charging module into the dock: each has its own, Apple-certified module built right in. But one of these has the slightly smarter design that brings in a couple of helpful benefits, and it may be enough to make the difference for you. Here’s how they compare. 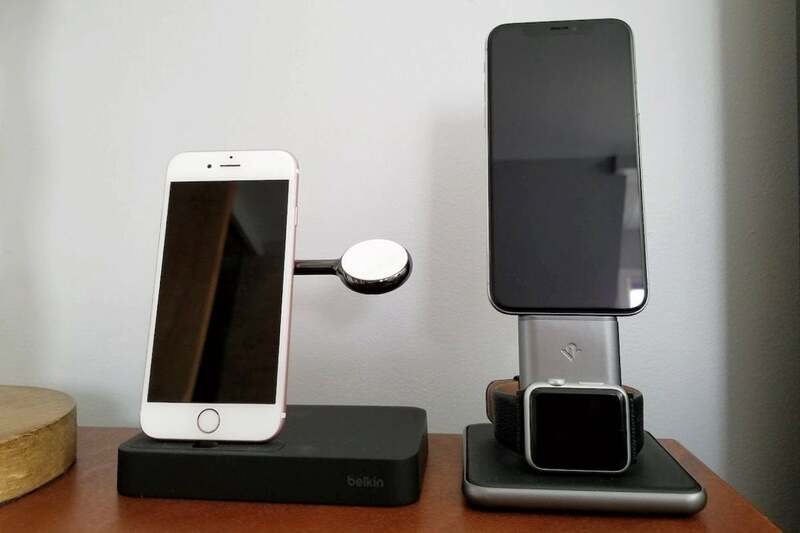 Belkin's Valet Charge Dock holds and charges both devices with ease. Belkin’s Valet Charge Dock isn’t new—it has been around since late 2015, and it was the first device on the market to charge both devices without any need to use your existing charging cables. 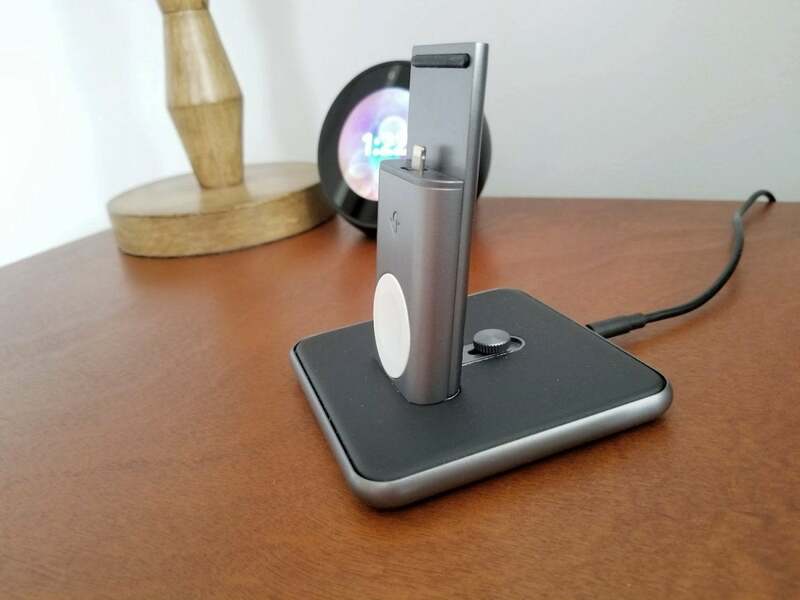 The Valet Charge Dock has a heavy plastic base that measures 3.4 by 5.2 inches, with a sturdy chrome arm that sticks out and performs two roles: it supports the iPhone plugged into the Lightning connector in front of it, and it houses the Apple Watch charging module as well. In use, your iPhone sits on the Lightning connector and then reclines back slightly to rest on the left part of the arm, and then your Apple Watch attaches on the right and stays put thanks to the magnetic connection. If you use a heavier watch band (like a metal one), then you can attach an included plastic support around the module to ensure that the Watch doesn’t sag off. And if you have a case around your iPhone, the Lightning connector can be raised and lowered with a dial on the back to ensure that the device can slot right onto it. A small dial on the back changes the positioning of the Lightning connector. It’s meant to be clean, straightforward, and easy to use, and that is thankfully the case in practice. Your iPhone and Apple Watch can pop on and off easily, and they’ll charge simultaneously using the one included power brick. At $130, it’s not cheap—but the Valet Charge Dock looks and feels pretty premium, and it’ll save you some hassle and clutter at the same time. Your iPhone will look high and mighty with Twelve South's HiRise Duet. Twelve South likes to put Apple products on a pedestal, with other HiRise devices available for the iPhone/iPad and even MacBook, but the HiRise Duet smartly handles both an iPhone and Apple Watch with minimal bulk. At 3.75 inches square, the HiRise Duet has a smaller footprint than the Belkin alternative, and that’s because Twelve South’s dock effectively stacks your devices: the Apple Watch sits at the bottom, while your iPhone or iPad charges on the top. The HiRise Duet has a shorter support behind the Lightning connector, but it’s enough to keep your iPhone safely upright while charging. If you want a little extra support (say for a Plus model), there’s an optional included base attachment that can be installed with ease. The Lightning connector can also be moved up and down to accommodate cases, although it’s not as easy as just turning a dial—you’ll need to use the included wrench. The HiRise Duet takes up very little space, making it perfect for smaller (or cluttered) bedside tables. 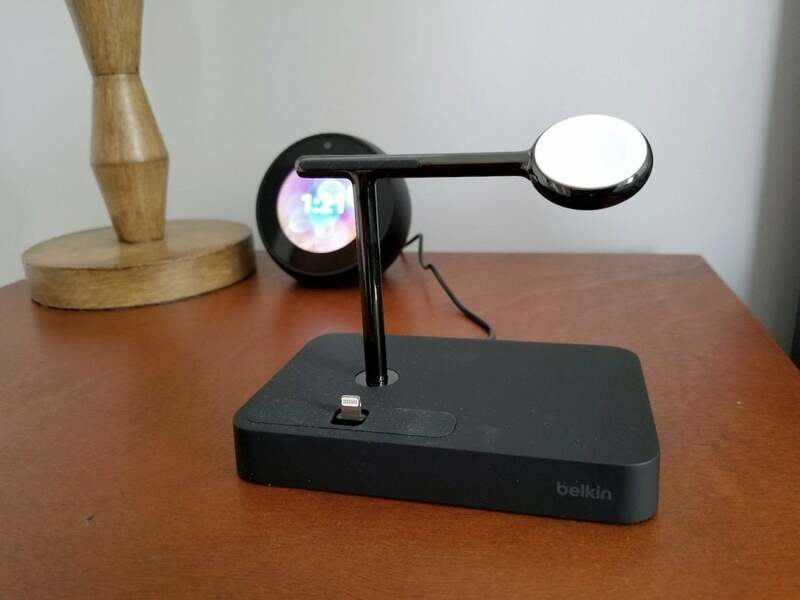 Wrapping your Apple Watch sideways around the bottom comes with another nice benefit over the Belkin approach: it allows your Watch to display in Nightstand mode, putting a large digital clock in view when you touch the device. And the base has a leather surface, so you don’t have to worry about scuffing the Watch on metal. Otherwise, like the Valet, the HiRise Duet nails the fundamentals: it charges and supports both devices at the same time without a potential mess of cables around your nightstand. And at $120, it’s $10 cheaper than Belkin’s offering. Both of these devices can get the job done at comparable prices, but the Twelve South HiRise Duet packs in some nice perks. 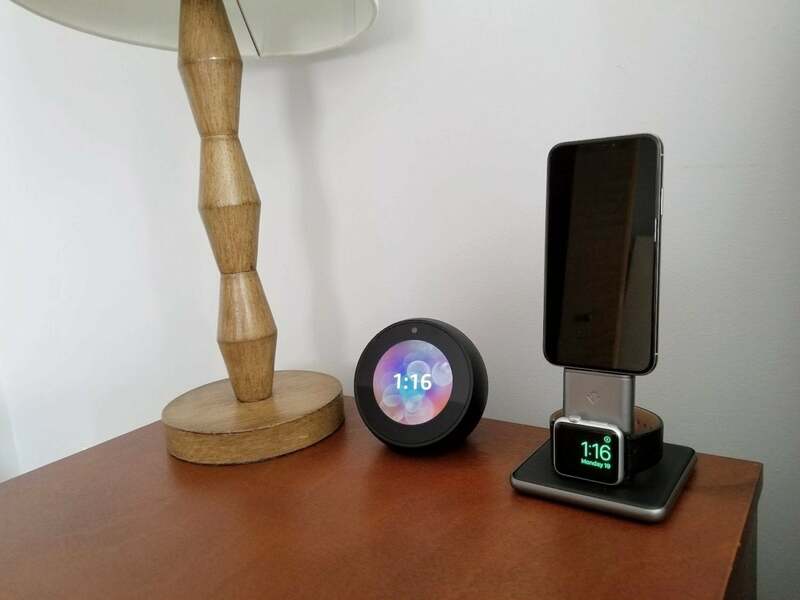 It takes up less space on a nightstand or desk, puts your Apple Watch in Nightstand mode, and even comes with international plug adaptors that make it an ideal travel charging device. The fact that it’s $10 cheaper is just the cherry on top. If you like the style of the Belkin Valet Charge Dock better, or happen to find it on sale, then you’ll still find much the same critical functionality. In either case, $100-plus is a lot to spend on a dedicated charging station, but they’re both great if you want a sleek and efficient dual charger that minimizes cords. Ultimately, the HiRise Duet stands slightly taller in this comparison, offering helpful added features at the lesser list price.